Home » »Unlabelled » This Math Problem Has The Internet Stumped. Do You Know The Right Answer? 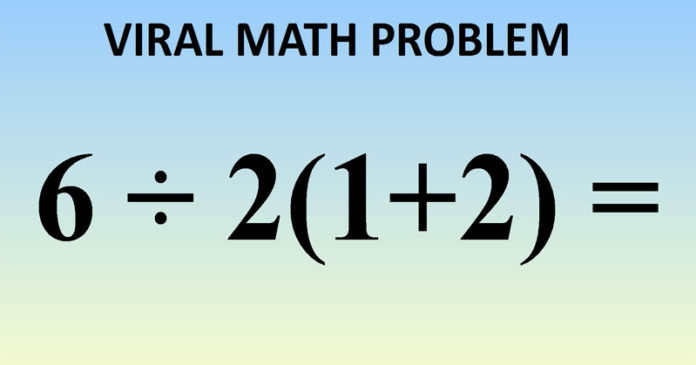 This Math Problem Has The Internet Stumped. Do You Know The Right Answer? To say there is no right answer when it comes to math, to some, is akin to heresy. More than that, some might say it’s illogical and completely erroneous. Math is math; it doesn’t change. But the truth is, it does, and has changed. And arriving at different answers all has to do with the order of operations. For example, if you’re taught, all your life, that the standard color of the sky is called “red”, then you perhaps will grow up believing all shades of blue are actually called various shades of red. Or, if you’re told that a blue-green color is teal, but someone else calls it turquoise, you might find yourself in a debate of proper color names. While it’s easy to argue that calling blue “red” is wrong, it’s not so easy to say that blue-green is not both teal and turquoise, depending on who you ask. In the matter of you and the other individual, you were both taught different things about the same color. And sometimes, a similar problem happens where math is concerned. Except, with math, it gets a little more rigid than color names, as it involves using a set of instructions in order to arrive at the right answer. Most people know these instructions as the order of operations. And different people have been taught different things about the correct order. For example, how would you solve the following equation? If you end up with an answer of either 1 or 9, you’re not alone. The vast majority of people ended up with either one of those answer. Some reportedly think it is 0, 3, or even 6, but none of those three answers are at all correct. However, the reason why 9 and 1 are given as the main answers for this problem all boils down to how people were taught to do math.